At the 2018 Fields & Futures Bowtie Ball, coaches from Northwest Classen High School stood center stage and proudly accepted the 2018 Tommy Noble Fields & Futures Linking Arms Partner Award, presented by Inasmuch Foundation. This award is presented annually by Fields & Futures to an individual or group that best characterizes our mission to ignite hope and confidence in the students of Oklahoma City Public Schools by growing sports participation. Across the board, school sports is the chain that consistently links students to academics. The stronger the chain, the better the performance in the classroom and the community. A chain, however, is only as strong as its weakest link. 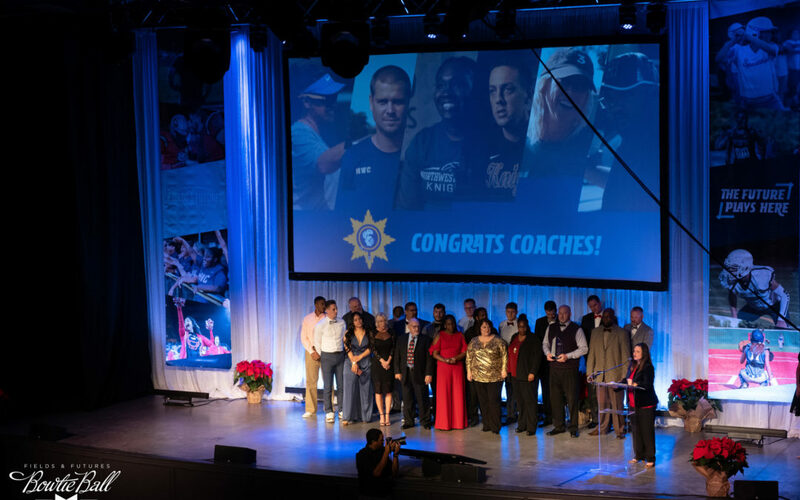 In areas struggling with high rates of crime, poverty, and drop-outs, a revolving door of coaches can be the chain’s greatest defect. At Northwest Classen High School, Athletic Director Cindy George has spent the past few years replacing links and strengthening the chain. Not long ago, the average tenure for a coach at Northwest Classen was just one or two years. Three years was almost unheard of. Today, three years is on the short end. That George has been able to institute a culture of loyalty and longevity within the athletic department is an admirable feat. It’s a tough environment, with tough kids and tougher circumstances. But these coaches understand their job is not just to win games. It’s to win students. They accomplish this by simply being there, day after day. By being the constant in a world of chaos and unpredictability. And when that seems like an impossible task, they have each other to lean on. They have each other to link arms with. Congratulations, Northwest Classen High School Athletics! It is our honor to call you our partner.